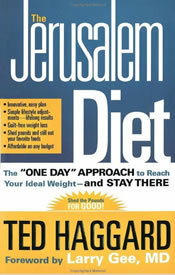 Despite the title of the book, ‘The Jerusalem Diet’ does not have anything to do with Jerusalem apart from the fact that the author, Ted Haggard, happened to be there when he was inspired to create the concepts that are the foundation of his diet plan. The book basically outlines his personal weight loss story. Haggard traveled to Jerusalem in 1998 and realized that he had gained too much weight. He decided to eat only fruit, vegetables, nuts and seeds for one day and discovered that his clothes fit better and his sense of wellbeing was improved. He created a long term weight loss strategy based on monitoring fat loss with regular weigh ins and periodic days of light eating. Dieters are advised to weigh themselves every morning and to set a weekly weight loss goal of one pound. On days when the goal weight for that week is exceeded the only foods allowed are fruit, vegetables, nuts and seeds and water is the only beverage to be consumed. On these days dieters must also exercise for one hour. On days when the scale weight is below the target, dieters are permitted to eat freely, within the general guidelines of a healthy diet. No foods are restricted and there are no limits on portion size. This plan seems to provide an incentive to avoid overeating on ‘free’ days so as to avoid the rigid confines of the days when the diet is restricted. Although it not an essential aspect of his plan, Haggard mentions that a 1-3 day fast every few months may have both physical and spiritual benefits. Dieters are also encouraged to practice self acceptance and deal with failures in a healthy way. Haggard provides imagery and guided visualization techniques that are designed to be used during both the weight loss and maintenance stages of the diet. The Jerusalem diet places a lot of emphasis on eating fruits, vegetables and nuts. Organic foods are preferred although not considered essential. The book also provides a list of soup recipes that are designed to promote weight loss. Look here for other Jewish inspired recipes. On days when the scale weight is over the target for that week, one hour of exercise is recommended. Haggard advises dieters to exercise in accordance with capabilities and not push too far. These exercises can be used with the Jerusalem Diet. The Jerusalem Diet retails for $17.99. It is also necessary to purchase a reliable digital scale which can range from $20 – $250. Daily weighing has been shown to be a strong predictor of success in weight loss maintenance. Recommends a safe rate of weight loss at one pound per week. Flexible and not restrictive. Enjoy all your favorite foods. Advocates importance of a general healthy lifestyle and exercise. Addresses aspects of emotional eating. Calorie cycling can help keep metabolism working efficiently. Does not provide detailed advice for meal planning. Scale weight may be influenced by fluctuations in water balance in the body and may not reflect true fat loss or gain. Does not give precise information about nutritional concepts. Although the Jerusalem Diet is an unconventional and not exactly scientific approach to dieting it does actually appear to provide dieters with a successful strategy for healthy long term weight loss. Concentrating on a weekly weight loss of only one pound a week and dieting for only one day at a time also has distinct psychological advantages. The nutritional concepts of the diet could almost certainly do with some improvements however by following Haggard’s advice most people will probably enhance their lifestyle in a way that promotes not only weight loss but general health. Haggard is actually encouraging dieters to change their eating habits slowly so that in effect dieters gradually work their way toward the approaches of most mainstream diets while avoiding the feelings of restriction that are common at the beginning of a change in diet. This is actually a really awesome diet, and I’m surprised that it hasn’t taken the world by storm yet. Instead of thinking, “Gosh, I’m going to be on this horrible diet for a year until I finally lose all the weight!” you only need to “diet” for essentially one day each week, because when eating only fruits, vegetables, nuts, and seeds for one day, and exercising for an hour, the weekly pound comes off very easily, allowing you to do and eat whatever the heck you want for the rest of the week (or until your next Fat Day). Anyway, sorry if this is incoherent, but this plan was what helped me lose ten pounds after my freshman year of college. I found it incredibly easy, past the willpower part! I tried this for a week and lost no weight!!! !